Die neue Version sollte einfach als Update bei deinen TeamSpeak 3 Client erscheinen. Achso und die Version ist Stable. Ja das hättest du dann genauer beschreiben sollen, ich geh mal davon aus dass es für Windows, MAC OS & Linux erscheinen wird. Aber Windows wird höchstwarscheinlich die erste Version sein die für die Öffentlichkeit zur Verfügung steht. I know you can't reveal much, and I know the beta is coming soon... But, is there ANY hints or sneak peaks you can give us and right now? Anything at all? I'm dying of curiosity and excitement. First staff member to snitch will be rewarded cookies. Is there some information about the new API? I would like to know if the new API is also C# based and is ClientQuery extended? The best RESTful API in the World! Update: To the brainless here, it's ironic! Last edited by SossenSystems; August 23rd, 2018 at 11:33 PM. When this is all they have planned then well.. rip. So they just implement a new UI (maybe some 2014 or 2015 level of art style), some new API calls and tweaks and then a global myTeamSpeak friendlist with a chat feature and call it a day? News from Gamescom: Ts5 will be ready in about 6-8 weeks. 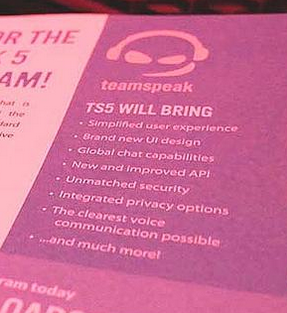 They showed us a video of ts5( color like Discord(dark etc. ), Chat on the right and much more. TS5 becomes violent! Where does the picture come from? - Integration of other service, which they started with twitch but well.. its kinda experimental how they have done it, I mean one whole day for subscriber to receive the actual server group? Everything more than 15 mins is questionable in my eyes. - A Steam/Origin/Uplay integration to see what your friends play atm (TeamSpeak is still primary a gaming software). - A mobile app that won't cost 2 bucks and still lacks behind in development. That were my hopes. Lets see what we will get. I doubt it will be that much. Edit: The cherry ontop would have been a reworked license system for a TS5 server system. Where I can log into myTeamSpeak and change the amount of slots for each license I own in real time. So no more 64, 128, 256, 512 slots licenses. I pay per slots and the more, the cheaper. So I just pay for what I really need/use and can still selfhost.